Director Edgar Wright has been busy with "Scott Pilgrim Vs. The World" for the last year or longer and now that the film is moving closer to a release date, the director has begun to peer into his own future and next project. It is no mystery that the Shaun of the Dead and Hot Fuzz director had previously penned a draft for "Ant-Man." What MTV and Wright have confirmed today is, he intends to move forward on a 2nd draft. Wright said, "I can’t do two things at once, so [now that 'Scott Pilgrim' is finished] I will return to doing another draft of that one." Wright told MTV that he and Marvel producer Kevin Feige have a plan to figure out a really good script. He explained speaking as Feige, "Lets make a good script that works, that’s all about a great genre film, and that isn’t necessarily relying on anything else." Really good to hear that Marvel is allowing Wright to take his time and find the right tone and story for a feature film. Wright gave further explanation of their intention. He said, "Because that character isn't one of their biggest properties, it’s not like a tentpole deadline." 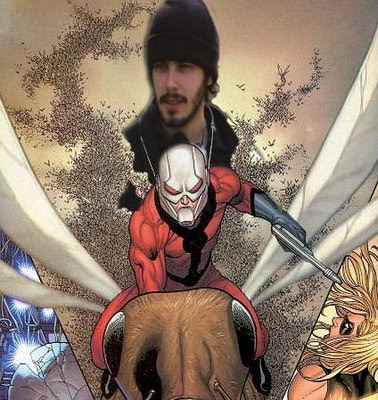 I love Edgar Wright and his brand of humor and think he is the perfect guy to bring Hank Pym and Ant-Man to theaters. Added with the fact that Marvel and he have worked out something that seems to have very little pressure other than creating a great genre film. With no time table for the project, it's pretty clear that Ant-Man won't be making an "The Avengers" appearance (or at least not in the first film). On a final note, Edgar Wright made sure to point out that he would not give out any further information because Marvel's henchmen could be waiting in the shadows in anything more was said. He exclaimed, "I cannot confirm or deny anything. I’ll get killed. ... It's snipers, they’ll kill me!"